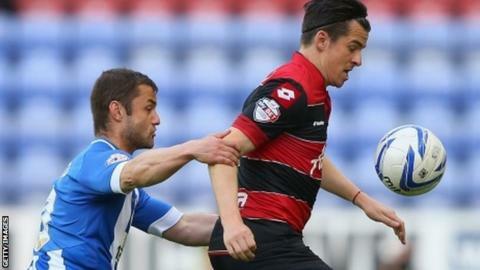 Wigan failed to break down Queens Park Rangers as their Championship play-off tie was left hanging in the balance. Latics striker Marc-Antoine Fortune failed to capitalise on two good second-half chances, while QPR keeper Robert Green saved from Gary Caldwell and Jordi Gomez before half-time. Armand Traore went closest for QPR. However, Rangers skipper Clint Hill was lucky not to concede a penalty in the opening stages after appearing to elbow Latics defender Rob Kiernan. May the fourth be with QPR? Rangers are aiming to break a 16-year hoodoo by winning the Championship play-offs. The side finishing fourth in the second tier has not won promotion to the Premier League since Charlton in 1997-98. The result leaves the semi-final perfectly poised ahead of the second leg at Loftus Road on Monday. Both clubs were relegated from the Premier League last season and know the play-offs are their last chance to secure an instant return back to the top-flight. But they headed into the play-offs on the back of three defeats in four matches and, despite shading possession, appeared to lack confidence in the final third. Without top scorer Nick Powell through tonsillitis, Wigan did create an early chance when centre-back Caldwell planted a free header into the hands of QPR keeper Green from Gomez's corner. A scrappy first half was littered with stoppages and yellow cards, but almost ended in a Wigan goal when Spanish midfielder Gomez chested down a long ball from the back before seeing his low drive blocked by Green. Hoops boss Harry Redknapp pledged before kick-off that his team would "have a go" at their hosts, but that failed to materialise in the opening 45 minutes as his team prioritised keeping a clean sheet. Lone striker Charlie Austin found himself isolated for the visitors, who went closest when right-midfielder Traore met Junior Hoilett's precise left-wing cross with a firm header that lacked direction. A goalless draw was perhaps to be expected after just one goal in the two previous matches between the sides this season. They drew 0-0 at the DW Stadium in October before QPR nicked a 1-0 home win in March. A goalless draw was perhaps to be expected after just one goal in the two previous matches between the sides this season. They drew 0-0 at the DW Stadium in October before QPR earned a 1-0 home win in March. However, Redknapp threw the shackles off his side after the break as Rangers attacked the stand housing 3,000 travelling fans with positive intent. Latics keeper Scott Carson, who barely had a save to make in the first half, had to punch clear QPR skipper Hill's hanging cross before going down low to his left to push clear Traore's snapshot. Wigan rallied in response around the hour mark, with Fortune ballooning over a drilled cross from team-mate Kiernan and then seeing another effort blocked by QPR defender Nedum Onuoha. Rosler, seemingly desperate to take a lead into the return leg, made a double attacking substitution with 15 minutes remaining, introducing strikers Martyn Waghorn and Nicky Maynard. But the Latics could not find a winner, leaving Brighton and Derby County - the sides contesting the other play-off semi-final - no wiser about the identity of their possible opponents at Wembley on 24 May. Clint Hill to Sky Sports: "I have apologised. I caught him. It was a little bit reckless." Wigan manager Uwe Rosler on incident: "I haven't seen it. But I was told that he had caught the player." On the tie: "We knew it would be a tight game but the positives were that we kept a clean sheet and controlled the game. At times we could have been a little braver with filling the box with more people. Occasionally we did that and had two or three chances. Against a top team you don't get many chances and you have to take the ones you get. QPR came here to get a result but now they have got to come out at home and win the tie. The pressure is on them now." QPR manager Harry Redknapp: "It was a game of very few chances, there was nothing in it. It is all to play for - you wouldn't like to pick a winner. We're at home but they are a dangerous team, who came down to Loftus Road the other week and there was nothing in it. If you were a bookmaker it would be evens." Match ends, Wigan Athletic 0, Queens Park Rangers 0. Second Half ends, Wigan Athletic 0, Queens Park Rangers 0. Nedum Onuoha (Queens Park Rangers) wins a free kick in the defensive half. Clint Hill (Queens Park Rangers) wins a free kick in the defensive half. Substitution, Queens Park Rangers. Yun Suk-Young replaces Junior Hoilett. Offside, Wigan Athletic. Scott Carson tries a through ball, but Martyn Waghorn is caught offside. Attempt missed. Joey Barton (Queens Park Rangers) right footed shot from outside the box is too high. Assisted by Junior Hoilett. Attempt missed. Emmerson Boyce (Wigan Athletic) header from the centre of the box is high and wide to the left. Assisted by Jordi Gómez with a cross following a corner. Corner, Wigan Athletic. Conceded by Joey Barton. Substitution, Queens Park Rangers. Niko Kranjcar replaces Ravel Morrison. Substitution, Wigan Athletic. Martyn Waghorn replaces Callum McManaman. Substitution, Wigan Athletic. Nicky Maynard replaces Marc-Antoine Fortuné. Attempt missed. Gary O'Neil (Queens Park Rangers) right footed shot from outside the box is high and wide to the right. Assisted by Ravel Morrison. Attempt missed. Junior Hoilett (Queens Park Rangers) right footed shot from outside the box misses to the left. Assisted by Joey Barton. Substitution, Queens Park Rangers. Kevin Doyle replaces Armand Traore. Attempt blocked. Marc-Antoine Fortuné (Wigan Athletic) left footed shot from the centre of the box is blocked. Assisted by Jean Beausejour with a cross. Attempt missed. Marc-Antoine Fortuné (Wigan Athletic) right footed shot from the centre of the box is too high. Assisted by Robert Kiernan following a corner. Attempt missed. Robert Kiernan (Wigan Athletic) right footed shot from a difficult angle on the right misses to the left following a corner. Corner, Wigan Athletic. Conceded by Clint Hill. Corner, Wigan Athletic. Conceded by Danny Simpson. Attempt saved. Robert Kiernan (Wigan Athletic) header from the centre of the box is saved in the bottom right corner. Assisted by Jordi Gómez. Attempt blocked. Shaun Maloney (Wigan Athletic) right footed shot from outside the box is blocked. Corner, Queens Park Rangers. Conceded by Robert Kiernan. Attempt saved. Armand Traore (Queens Park Rangers) left footed shot from outside the box is saved in the bottom right corner. Foul by Gary O'Neil (Queens Park Rangers). Second Half begins Wigan Athletic 0, Queens Park Rangers 0. First Half ends, Wigan Athletic 0, Queens Park Rangers 0.